The Barnett shale gas play is located within the Fort Worth and Permian Basins in Texas. 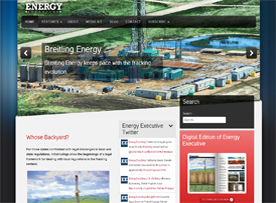 The Barnett shale is divided into two sections: the “Core/Tier I” and the Undeveloped. The Core/Tier I section corresponds to the areas of the Barnett Shale that are currently under development. It is primarily located in the Parker, Wise, Johnson, and other neighboring counties. The undeveloped section corresponds with those areas of the Barnett that have not been developed by the companies. 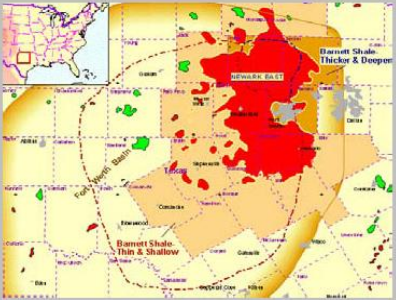 Because the Barnett extends across two petroleum basins that are in different regions of Texas, the active and undeveloped sections of the Barnett were further subdivided for modeling purposes. The total area for the Barnett, as estimated by USGS is 6,458 square miles. This area is subdivided into two sections: the Greater Newark East Frac-Barrier Continuous Barnett Shale Gas (1,555 square miles) and the Extended Continuous Barnett Shale Gas (4,903 square miles). As the development of the Barnett extended beyond the Newark East field, the active section of the Barnett was also extended. The remaining area is considered to be undeveloped section of the Barnett. The TRR in these sections is shown in Table 36. The Barnett shale gas play, including the active and undeveloped areas, has an average EUR of 1.4 BCF per well and approximately 43.37 TCF of technically recoverable gas. An average EUR and well spacing for the active area are based on company data. These values were used to calculate the average well and TRR for the undeveloped section of the Barnett. Other average properties were estimated for the Barnett shale play. These include the depth (7,500 ft.), thickness (300ft), and porosity (5%) for the shale. In 2008, there were 10 companies holding leases in the Barnett Shale Core and 10 companies in the South/Western section of the shale. These Companies have leased a total of 2,608,122 net acres (4,075 square miles). The well costs reported in 2008 and 2009 have been between $2 and $3 million dollars for a well in the Barnett Core. The costs in the Southern and Western counties have a larger range – between $1.6 and $3.7 million per well. 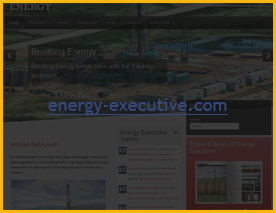 The differences in costs are consistent with EOG Resources reported costs. There is significant current drilling activity in the Barnett. There are at least 58 rigs currently active in the shale. Of these, EOG Resources operates 14, and 22 are operated by Chesapeake.